PLEASE NOTE: Messing about with batteries/cells can be hazardous: Most cells contain hazardous materials and injury and/or damage can result from mishandling them. Cells that are shorted, improperly charged or otherwise maltreated can pose an explosion/burn/chemical or other hazard. It is entirely up to you to do research and provide the appropriate precautions to prevent damage and/or injury. Acknowledgments: The information contained herein is from a many different sources ranging from personal experience to manufacturers data sheets, the experience of others, various articles, and the professional experience of some individuals that have long dealt with manufacturing products that use NiCd (and other types of) cells. In this latter group, I'd like to thank Robert Barth, DL1SDX, for his valuable insight. Additionally, see the disclaimer at the bottom of this page. The emphasis on this page has, over time, shifted from the use of NiCds to NiMH cells. This has to do with the fact the NiMH cells have more than twice the energy capacity of the same-sized NiCd cells and have achieved a high level of market penetration due not only to the higher capacity of the NiMH cells, but the fact that there is a preference toward the use of NiMH cells as they are far less hazardous in their disposal than NiCds which contain the toxic, heavy metal Cadmium. Why would one use Alkaline cells at all? Storage at normal room temperature: You can expect an Alkaline cell to retain 80% of its capacity after 7 years. By comparison, a fairly new NiMH cell will, through self-discharge, reached this same level after just 20 days. Storage in a hotter environment: If you stored Alkaline cells at 40C (104F) they would still have 80% capacity after 3 years whereas it would take just 10 days for NiMH cells to discharge to this point. At 60C (140F) Alkaline cells may drop to 80% in just 6-8 months - but a NiMH would do the same in just a day or two! In other words, don't use NiMH cells in items that you plan to store in your vehicle - or anywhere where they may be allowed to sit for months at a time! That is, don't put them in your emergency radio! As you can see for yourself, it is recommended that you DO NOT use NiMH cells in those situations where you would be storing a device for long periods without using it. Don't forget that Alkaline Cells can be bought nearly anywhere on Earth - and when you get them, they will likely have a full charge already in them: NiMH or NiCd cells are harder to find and they must be charged before you can use them! More recently there are "Ready-to-use" NiMH cells available. While I've not used them enough to have drawn a long-term conclusion as to their durability, they do, in fact, seem to have a lower self-discharge rate than "normal" NiMH cells - at least when they are new. A downside, however, is that they typically have less capacity than a "normal" NiMH cell. If you are prone to leaving NiMH cells around, however, the self-discharge rate of "normal" NiMH cells may actually put these "ready-to-use" types at an overall advantage as it may just be that when you do finally use them, they have more charge left on them! Rechargeable cells are quite economical: Even if abused, they generally cost less to operate on a per-hour basis than non-rechargeable "primary" types like Alkaline cells. They do no usually have the energy density (the amount of energy with respect to their volume) of Alkaline cells. What this means, in plain English, is that a rechargeable AA cell cannot store as much energy as an Alkaline AA cell. This means that you will need more rechargeable cells to run the piece of equipment as long as an Alkaline cells would. "Resistance is NOT futile... it's E/I!" While alkaline cells generally more energy per-cell than rechargeable types (NiMH or NiCd) this energy may not be accessible to the appliance using that cell - particularly if it is a device that draws a lot of current. One good example of this is a Digital Camera. Digital cameras are notorious for seeming to have appallingly short battery life: A brand new set of batteries, in some cameras, may only allow one or two dozen pictures to be taken before they are "dead." A NiCd or NiMH battery, on the other hand, may last several times as long - even if that NiCd you used is rated to have about half of the amp-hour capacity of Alkaline, why did it seem to last longer? Internal resistance is the culprit. When fresh, the internal resistance of a good-quality AA alkaline cell is on the order of 0.15 ohms per cell, increasing to 0.3 ohms per cell when the it is 50% discharged. If your camera uses a battery of 4 cells, that means that the total resistance of new cells (excluding resistance of battery contacts and wiring) is about 0.6 ohms, rising to 1.2 ohms when the battery is 50% discharged. Not only this, the "nominal" voltage of an alkaline cell is 1.2 volts when it is at this 50% discharge point - a voltage that is comparable to NiCd and NiMH chemistries. Note: There are some newer types of Alkaline cells specifically designed for "High-Drain" electronic devices. While these cells do not necessarily have more capacity, they do generally maintain a lower resistance than standard alkaline cells and thus, the appliance may be able to utilize more of the cell's capacity. For more information on these newer types of cells, visit one of the manufacturers' web sites. Furthermore, more-recent digital cameras have been better-designed to handle the characteristics of alkaline batteries, enabling more usable operational life to be extracted from them. If the digital camera consumes, say, 800 milliamps (a reasonable amount when a flash is charging, a backlit display is operating, etc.) then cell resistance alone will dictate a voltage drop of 0.48 volts for a battery with new cells, and 0.96 volts or so for cells that are 50% discharged. Again, this does not take into account other resistive losses - such as contacts and internal wiring - some of which can be significant! For new cells in a 4 cell battery, this voltage will (optimistically - assuming a nominal 1.5 volt unloaded output) amount to about 5.5 volts under these conditions, dropping to about 4 volts when the cells are 50% discharged - a voltage that may be inadequate for operation of the camera. There is yet another problem: Often, cameras contain switching-type voltage converters. While these are efficient in their energy conversion, they attempt, by their nature, to maintain a constant power output over a varying input voltage. What this means is that, as the battery voltage drops, the current consumption will increase as the voltage converter attempts to maintain the constant voltage output - exacerbating the problem of already-low voltage. This problem can get worse when the camera's load changes because of a charging flash, a backlit display being illuminated, or the camera's CPU pulling more current when processing the image and saving it to memory. In other words, the cells may be, say, only 50% discharged, but the equipment (the digital camera, in our example) may simply be unable to use the energy that is still available. 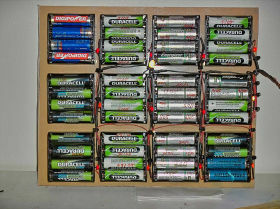 If this is the case you'll probably get plenty of life out of those same batteries if you put them in a small flashlight or portable FM radio, or TV remote control. In other words - don't throw them away just yet! Several years ago, a friend of mine (also a fellow amateur radio operator) was issued, by his employer, a "talkback" pager - one of those pagers that can send as well as receive messages - and he noticed something that seemed odd at first: It had both an Alkaline and and a NiCd cell in it. He quickly realized why this was done: While the Alkaline cell had the energy capacity, it was the NiCd that had the current-loading capacity: The transmitter drew enough current when operating that it would easily overtax the Alkaline cell, especially near the Alkaline's end-of-life when it's resistance was higher. NiCd and NiMh cells, on the other hand, typically have a much lower internal resistance over their charge life and this resistance (which varies depending on state of charge, temperature, age, condition of the cell, the cell's internal chemistry and its construction) is typically lower than that of an alkaline cell - even when the NiCd or NiMH cell is significantly discharged. According to info from a well-known manufacturer, a relatively new AA NiMH cell typically has about 0.17 ohms per cell when fully charged (as opposed to 0.15 ohms for a "fresh" Alkaline AA cell) and this rises to about 0.18 ohms at the "100% discharge" point. A typical AA Alkaline cell, on the other hand, can reasonably have over an ohm of internal resistance at 80% discharge - and this value skyrockets as the battery is discharged further. From what information that I have been able to find, a typical NiCd seems to have about half the internal resistance of the same-sized NiMH and is one of the factors that explains its suitability in very high current situations. What this means is that while an alkaline cell may be able to run the digital camera (our equipment example) only until the cell is at its 50%-70% charge level, a NiCd or NiMH battery can probably output the required current and voltage until it is at or below its 15% charge level. The lower intrinsic resistance also means that they are more likely to be able to tolerate impulse loads (i.e. additional current drawn by the flash charging, for example) without causing the camera to shut down due to low voltage. Comment: At the current level of technology, NiCd cells are usually preferred over NiMH cells for certain applications, most notably those requiring very high current consumption such as in battery-powered tools, etc. In these applications, the high current drawn by the tool may over stress a "typical" NiMH cell and likely result in shorter operational and useful life than a NiCd cell. It can be tricky to determine exactly when you have fully-charged a NiMH or NiCd cell. Often, the cell is overcharged slightly, at which point your charger can say "Oh yeah, it's charged already..." One "safe" way to charge either a NiCd or NiMH cell is via the "slow" charge. Typically, this is done at about 1/10th to 1/50 C. What is "C"? That is the capacity of the cell in amp-hours. For example, say that you have a 1 amp-hour cell that has been fully discharged. In that case 1/10th "C" would therefore be 1/10th of an amp, or 0.1 amps (100 milliamps.) This charge rate is maintained for 12-14 hours for a "dead" cell and at the end of this period, you may expect it to be fully charged. "Quick" charging often refers to a means by which the cell is fully recharged in about 4 hours, implying a "C/3" charge rate. At this rate, one would typically dump 120-150% (or even more!) of the cell's capacity to recharge that cell (assuming that it had been fully discharged, of course) and then switch to a "Maintenance" charge afterwords. "Fast" charging, on the other hand, usually refers to a method of charging a cell within an hour, implying charge rate of greater the "C."
"Quick" and "Fast" charging requires careful, constant attention to the charge state of the cell(s) being charged. At these higher rates (which could be 2C or higher) the cell will heat up and, if care is not taken, be damaged. A good high-rate charger (of either the "quick" or "fast") has means of monitoring the temperature of the cell(s) and the voltage, and possibly how much energy has been already dumped in - not to mention a "fail safe" timer that will unconditionally terminate the charge after a certain amount of time. In other words: Don't quick-charge unless your charger have a means to monitor all of these parameters (the first two, anyway) closely. Note that the faster you charge the cell, the less-efficient the charging becomes as more and more energy is lost in heat, at least partially due to I2R losses, and this should be kept in mind if you have a limited power budget - say, charging from a solar panel. If you can afford the time, you are better-off "slow charging" in that case - if your absolute power is limited. As the name implies, this occurs when you continue to dump energy into the cell - even after it is fully charged and when this happens the energy has to go somewhere, the most obvious effect being heat. If you are "Slow" charging cells and they become even slightly warm, they are already overcharged! Likewise, while heat is a normal by-product of "quick charging" a cell, when the energy is no longer being chemically converted (as in the charging process) the cell will suddenly start to warm up even more: One of the indications of full/overcharge is a sudden rise in cell temperature. If charging persists even after "full charge" is reached, not only is heat produced, but gases can be generated as well. Small amounts of these gasses are normal, and may be reabsorbed into the cell's chemistry. If gas production is too high, pressure will build up and safety vents built into all types of cells will allow the excess gas to escape. Because this gas is derived from the cell's electrolyte, venting implies that some of the cell's capacity has just escaped into the air. If one particular cell vents more material than another, then it can become the "weakest link." As you will read below, this is bad. Another effect may be present when the cell is in a continuous state of "slight" overcharge. Normally, when charging, the gasses that are produced (one of which is oxygen) are re-absorbed by the cell's chemistry. Oxygen, however, is an extremely corrosive element and may contribute (along with the elevated temperature) to breakdown of portions of the cell's internal structure - including the plastic (usually polypropylene) separator. When this separator starts to fail, self-discharge can greatly accelerate. All of this can happen even if out gassing has not occurred. Click the image for a larger version or visit this link for more information. In the case of NiMH cells (where the self-discharge rate is rather high - especially as the cell ages) it may be desirous to leave it on a "maintenance" (or "trickle") charge for very long periods of time. Recent recommendations by some battery manufacturers suggest a "C/300" current for this while other manufacturers recommend a charging rate as high as C/40. Following the C/300 example, our hypothetical 1 amp-hour cell above, this would be about 3.33 milliamps. I have not seen any specific recommendations for such a maintenance charge for NiCd cells, but I would expect that the same C/300 rate would be suitable and my empirical evidence corroborates this. It should go without saying that charging a "dead" battery at the maintenance charge rate may take weeks to accomplish! A "Floaty-Thingie" - A simple device to maintain NiMH cell charge during periods of non-use. To reduce the likelihood that I'd pick up a NiMH cell - only to (later) discover that it was already mostly dead - I built the "Floaty-Thingie". This device consists of a series of holders for NiMH cells and connected to each holder is a very simple circuit that provides a small maintenance charge - at least enough to counteract the inherent self-discharge of the NiMH cells themselves. Go to the Floaty-Thingie web page for more information about this device. One of the best-known properties of NiCd cells is this thing that people refer to as "Memory." One of the first places that the so-called "memory effect" was first noticed and quantified was when NiCd cells were first used in communications satellites. These satellites rely on solar panels for their power, but the Sun is eclipsed by the Earth at times and it is during these periods that the satellite must operate from battery power alone. These eclipses were typically of very similar duration, which means that during the "eclipse season" the battery is run down by about the same amount, time after time. The "memory" was noticed when, after several eclipses, the battery voltage would relatively quickly drop to the voltage attained during the latter part of the eclipse - and typically stay there. It was also noted that this "memory" effect could be reversed simply by charging the battery and then discharging it to a different point for several cycles. This was done by clever management using multiple battery strings onboard the satellite and preventing a battery string from being discharged to the same point repeatedly. Little (or no) permanent damage was actually done to the cells by this "memory" effect - the result was (more or less) a temporary reduction in the cells' capacity until they were conditioned appropriately. In typical use by those who use NiCd-operated devices, it is unusual to discharge the battery to precisely the same point time-after-time. Usually, the amount of discharge is somewhat random - and just one or two variations from a precise cycle will "erase" the memory effect. Among the very few documented cases of "terrestrial memory" have been in pager service where, regular as clockwork, the batteries would be run down during the day and recharged overnight. This was a long time ago - back in the days when pagers were those half-brick sized things that only VIPs and doctors wore - and batteries only lasted a day or two anyway! It has been reported that NiMH cells can also exhibit this same "memory" effect - but remember that it is atypical to expose a cell to very precisely repeated discharges of equal depth time after time: Most people just don't use their battery-operated devices that way! For more information about the "Memory" effect, please read the following Wikipedia articles and their references/links: Wikipedia Article: Memory Effect and Wikipedia Article: Nickel Cadmium Batteries - Memory effect. "I have a (the name of an electronic device goes here) and the manual says to run the batteries down to avoid memory effect. The manual has to be right, doesn't it?" This is very common - I have several devices (like a cordless phone) made by some very reputable companies that suggest that one should completely discharge the battery occasionally to avoid the "memory" effect. All I can say is DO NOT DO THAT!!! Why would they say that, then? Generally, the manufacturer of the device does not also make the batteries as well - and certainly, the person who wrote the manual didn't know any better. For the more conspiratorial-minded of you out there, perhaps it is simply a plot to sell more batteries? In contrast, on my "new phone" I had to replace the NiMH batteries after just 2.5 years: The batteries on the two phones went bad at about the same time, and the one in the phone that I rarely use actually died first! "What is this thing (mis)called 'Memory' then?" Abused NiCd cells will typically exhibit a loss of capacity and/or the inability to take or retain a charge, and it this property that is too-often misidentified as "memory." But, this is not "memory." What is going on, then? There are two things that might be happening: Cell Reversal and "Lazy Cell" Syndrome. Let's talk about cell reversal first. It is cell reversal that probably kills more NiCd packs than almost anything else and its effects are often those mistaken as "memory"! A battery typically consists of cells wired in series for higher voltage. Ideally, all cells will run down at exactly the same time. This is not usually the case - especially as the cells age. Temperature has a large impact on cell longevity. A cell that is operating at a higher temperature will generally have a shorter overall lifetime than one that is cooler. 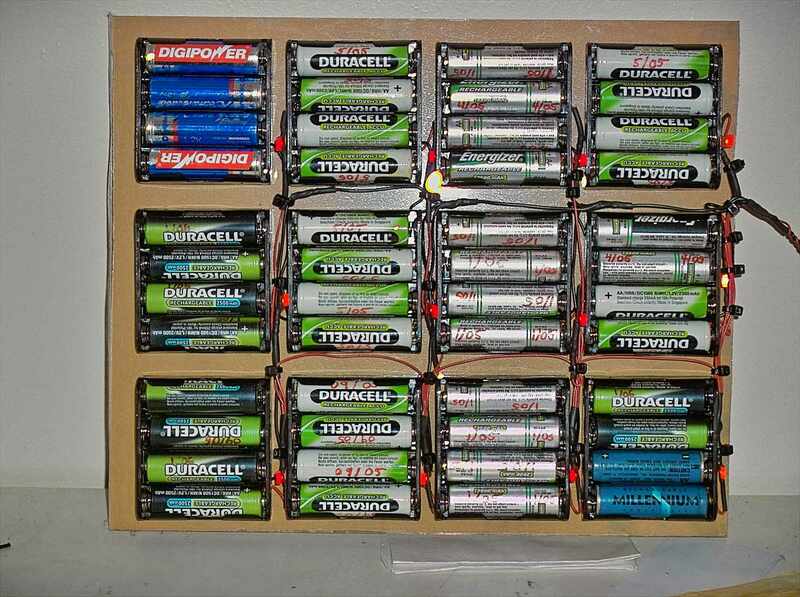 An effect of this can be noted in a large battery pack (such as that on a cordless drill) in which a large number of cells are grouped together. Often, the cell(s) in the "middle" of the pack die first as these are surrounded by other cells: Not only can these "inner" cells not get rid of their own heat as easily as those cells on the "outside" layer of the pack, but they are also exposed to heat from the cells that surround them! How important is heat to the life of a cell? One oft-quoted statistic (that I've not verified personally with NiCd cells) is that for every ten degrees F of temperature rise above 80 degrees F, the usable lifetime of the cell will be halved! Even if these numbers aren't correct, one can be assured both emperically and by the manufacturers that cells that are warmer will die sooner! Inevitably, one or more cells will run down sooner than the rest and its voltage will drop. Because the other cells still have some charge, current is still flowing through the cell and the voltage will not only drop to zero, but it can go below zero and effectively start to "charge" backwards. The effect of this is a very quick death to a NiCd cell! Why? It comes down to chemistry. When a NiCd cell is reverse-charged, a strange thing happens: Conductive metallic "hairs" (often called dendrites) begin to form and they "grow" from one electrode to another. Eventually, this dendrite forms a short across the cell - one that can have a range of resistance from high to low, depending on the severity of the damage. Note: NiMH cells do not seem to exhibit this "dendrite growth" problem, but cell reversal tends to cause gasses to be generated. If these gasses are produced as too high a rate, they cannot be reabsorbed internally and pressure will build within the cell, causing outgassing and resulting in a permanent loss of cell capacity. You may have heard about a technique for "restoring" NiCds often referred to as "Zapping." As the name implies, one dumps a brief surge of energy into the cell and, almost as if by magic, the cell is "restored" to operating condition. The surge of energy should be limited - often, a "zapper" consists of a very large capacitor (50,000 to 200,000 microfarads) charged to 50-100 volts, the source voltage disconnected, and the energy of this capacitor is dumped into a cell via a very heavy switch or a beefy SCR. This "one shot" short burst prevents too much energy from being dissipated by the cell and blowing it (and the person doing the "zapping") up. Another method uses a lower voltage - but much higher current - say, from a large power supply: The obvious disadvantage of this latter method is that it is not "self limiting" (as is the one-shot nature of the capacitor discharge) and one can easily "pop" a cell either by burning open internal conductors or cause the cell to rupture due to sudden buildup of heat and gasses. Needless to say, neither situation (especially the latter) is particularly desirable. What is supposed to happen in this process is that enough energy applied to "fuse" (or blow away) the dendrite that is shorting (or "almost" shorting) the cell. Once this low-resistance path is removed, the cell can be charged again. It should be kept in mind that such a "repaired" cell, although it may be more able to take a charge than before, will still have reduced capacity and, when used in a battery, is still very prone to discharging early and going into reversal - again. Remember: The material that formed the dendrite no longer contributes to the charge capacity of the cell - even after you "zap" it. Furthermore, the cell contains a separator material that will often be damaged by dendrite growth and "zapping" - something that further contributes to self-discharge. If you do this technique, make sure that you have completely disconnected the cell/battery from the appliance being operated to prevent the voltage surge from the "zapping" process from damaging it. Finally, while you may get some additional use out of a battery as a result of "zapping" - I personally consider that "zapping" a cell may simply be buying me enough time to get replacements ordered and on their way. Note: It should go without saying that this "zapping" procedure can be hazardous: Not only are potentially dangerous voltages and currents involved, but there is a chance that the cell may explode and/or leak hazardous material. Finally, this procedure should be done only on an individual cell, and not the entire pack at once: That is, you must be able to access and test each cell you plan to "zap" individually. I reiterate: For reasons unknown to me, some manufacturers of battery-operated equipment recommend that you "condition" NiCd battery packs by running them completely down, and then charging them again. I guess that the claim is to prevent a "memory" condition from occurring - but it is already known that to cause this "memory" the cell would have to be precisely depleted to exactly the same charge state repeatedly: This just doesn't happen with most people's usage of equipment. Why do they make this recommendation, then? The cynical side of me says that they are just trying to sell more batteries or devices: By recommending that you go through some steps that are guaranteed to shorten battery life, they can increase sales! The other side of me would guess that the person writing these instructions is just poorly informed or just doesn't know any better. DO NOT try to drill that "last hole." Have you ever been using a cordless drill when, just before the battery goes completely dead, it suddenly slows down and loses most (but not all) of its power? At that moment, one or more cells have collapsed and are going into cell reversal. Your battery pack will last much longer if you stop using it the instant that the motor slows due to the voltage drop. Unlike alkaline cells, NiCd and NiMH cells will put out (more or less) the same voltage until they are almost totally dead - at which point their voltage will suddenly drop. If NiCd battery packs had the same sort of circuitry in them that Lithium-Ion battery packs did (e.g. a circuit that "disconnects" the pack when any one or more cells' voltage drops too low) NiCd packs would, on average, last much longer. Do not overcharge the cells. Nowadays, "smart chargers" are pretty good about preventing cell overcharge, but if a battery pack gets unusually hot, something may be wrong. So-called "trickle" chargers won't destroy a battery pack too quickly if they are left connected after the battery is fully charged, but it isn't a good idea to leave it connected forever. If the battery is noticeably warm when connected to a trickle charger, it is already overcharged. Overcharging NiCd or NiMH cells can cause gasses to form in the cell's electrolyte and if this pressure builds up, a safety vent in the cell can open (which is better than having the cell explode...) and the gas will be vented. This venting represents a loss of material - which also means a loss of cell capacity. Another phenomenon that can shorten life of a trickle-charged cell is the breakdown of the plastic separator due to its continuous exposure to oxygen at elevated temperatures. There is an effect that is often noticed with new cells of many types: Reduced capacity. A brand new NiCd (and possibly NiMH) cell may not have its full rated capacity when it is brand new - it may take a few (half dozen or dozen) charge/discharge cycles in order to get the full cell capacity. What can you do about this? Just use the cells normally - expecting that, for a little while, the "charge lifetime" will be be a bit lower than rated capacity. After some use, capacity will increase. Remember: Even in their "new, lower-capacity" state, they will probably work far better than the (bad) cells you are replacing! Cycle the cells a few times. Running them completely dead is a bad idea for reasons mentioned above. Unless you are needing their full capacity for, say, an upcoming public service event where you need as much capacity as possible, there is really little reason to do this! Personally, I would just use the cells normally, knowing that they will soon reach their full potential! This effect may also appear in cells that are kept at full charge for very long periods of time using a trickle or maintenance charger. In this instance, the problem is not due to cell damage, but it is thought to be due to the formation of very large crystals in the cell's electrolyte - ones that don't store and/or release energy as efficiently. As in the above situation, this condition may be effectively remedied by appropriately charging/discharging the cell for several cycles. DO NOT discharge a battery pack at a high rate of current. Unless you can individually monitor the charge state of each individual cell you will likely damage one or more cells due to reversal. Discharge the cells at no more than, say, 1/20th C (that is, 50 milliamps for a 1 amp-hour cell) and don't bother running any cell down much lower than, say, 0.9 volts: At this voltage, you have already "affected" pretty much all of the electrolyte in the cell and, in the case of a battery pack, it just isn't worth taking the risk of putting a cell into reversal. Don't just put a load across the cell (such as a resistor) and walk away, but have a circuit that will completely disconnect the load (and start charging again) once the voltage drops to the threshold. This means that any sort of "reconditioning" of a battery affected in this manner will take days and not hours! Say that you have a 4-cell battery pack. When "fully charged" (but not freshly off a charger) the unloaded voltage of the pack will be approximately 5.2 volts - more or less. If all four cells drop to a "finishing" voltage of 0.9 volts per cell, the voltage from the battery pack will be 3.6 volts. Note also that if you were to have a four cell battery that had one shorted cell and three good ones, it would very quickly drop to the 3.6 volt region. Therefore, you can reasonably assume that (if your battery pack is "reasonably" healthy - that is, no shorted cells) that 3.6 volts is the absolute lower limit of discharge voltage. Say that you have a 10-cell battery pack. When "fully charged" (but not freshly off a charger) this pack will present approximately 13 volts. At 0.9 volts per cell, this would work out to be 9 volts for the entire pack. However, you could have two shorted cells (with the rest of them being "ok") on a fully-charged battery pack and still have a voltage above 10 volts - and not be aware that you had lost some cells until you noticed that battery voltage had dropped much lower than the 9 volt lower limit - in which the "good" cells could still be operating at over 1.1 volts per cell. The table below shows the approximate amount of time that it takes to lose 10% of the cell's current charge capacity at different temperatures. These are typical values for new cells, published by various manufacturers. Note that aging/mistreated cells will probably exhibit much higher self-discharge rates. The data in the NiMH row depicts the self-discharge rate of "standard" NiMH cells and not those of the "Low Self-Discharge" variety. A - Storage or use of this type of cell at 60C violates the manufacturers recommendation for consumer-type cells and one may expect poor lifetime. It is not recommended that any cell be exposed to such high temperatures for an extended period of time. B - The self-discharge rate of LiIon cells varies widely according to its chemistry and manufacturer. Information on self-discharge rate at temperatures other than 20C was not available at the time of writing but, as in the case of other types of cells, it increases dramatically with increasing temperature and the age (and past use) of the cell. Their energy density is better: A NiMH cell has more charge capacity than the same-sized NiCd. They do not contain Cadmium - a toxic heavy metal - and thus do not pose as much of a disposal problem. They are (apparently) not prone to forming dendrites when they go into reversal - something that can kill a NiCd by shorting it out internally and/or raising self-discharge current - not to mention loss of capacity. They have a relatively high self-discharge rate: Just sitting around they tend to run themselves down more quickly - especially as they age. There are "low self-disharge" varieties of NiMH cells available that typically have somewhat lower overall amp-hour capacity than those not so-formulated. They have a slightly higher internal resistance and a lower current-carrying capacity than an equal-sized NiCd: This generally makes them inappropriate for use in high-current drain devices such as cordless power tools where the load may be several "C" (i.e. 2-3 amps of load per amp/hour of cell.) Newer types of NiMH cells are beginning to appear that do not have quite this limitation. It is more difficult to tell when NiMH cells are fully charged than NiCds. When NiCds are nearly fully charged, the voltage suddenly rises - and then starts to go back down again when an overcharge condition is approaching. NiMH cells will do this, but the magnitude of this voltage rise is only a fraction of that of NiCd cells and, under many charge conditions, may go completely unnoticed, hence the need to monitor the temperature of NiMH cells as well as to limit the amount of time over which a charge is applied. In practical terms, a NiMH cell may actually outlast a NiCd in terms of charge cycles even though they supposedly have fewer charge/recharge cycles. Why? A lot of NiCd cells "die" due to cell reversal (see above) and the resultant effects while NiMH cells do not readily form dendrite shorts when they go into reversal. Damage to a NiMH cell may still occur, though: Cell reversal causes gases to form in the electrolyte and it is possible that pressure will build up and the cell will vent and/or heat to build up. The resultant loss of gas means a loss of electrolyte material and a subsequent loss of capacity and the resulting heat can cause internal damage to the cell. Even without loads, all cells slowly lose their charge over time as the cell's chemistry slowly changes. In all cases, the rate of self-discharge increases dramatically as temperature also increases. The chart to the right compares various cell chemistries and their approximate rates of self-discharge showing how long one can expect to lose 10% of the cell's present capacity. Please note that these rates are typical published specifications by various manufacturers and, in the case of rechargeable cells, represent the sort of performance that may be expected from new cells. In general, independent testing has shown that the manufacturers' specifications concerning self-discharge are more-or-less in line with what is actually observed. Also, reduction of self-discharge is one of those parameters on which the manufacturers are continually improving. As can be seen, the clear winners are the non-rechargeable types. The two cheapest are the alkaline and Zinc Chloride (the "heavy duty") types and these do a respectable job of retaining their capacity over time. Ahead of the pack are the non-rechargeable Lithium types (The Lithium-Iron Disulfite and the Lithium Manganese Oxide) and these two chemistries also perform better than the others even when they are very cold. What about putting batteries in the freezer to "keep" them? For the non-rechargeable types, it can be seen that freezing them will certainly slow the self-discharge rates, but if you plan to use them within a year or two, you'll probably not see any real difference in longevity of those stored in your freezer and those simply kept at room temperature. What is clear from this chart is that you should not be storing them in your attic or garage - or anywhere else that may tend to get warm: It is preferred that they be stored simply in a cool location (such as a basement) as compared to a warmer room. Comment: As mentioned previously, there are newer types of NiMH cells (often billed as "ready-to-use") that have significantly lower self-discharge rates than traditional NiMH cells and it has been noted that these typically have lower capacities than similar-sized cells. At this time the self-discharge rate of these types of cells over their lifetime is unknown. You can't use NiMH cells in very high-current devices such as power tools. These sorts of demands on the cells will result in a very short lifetime and could be hazardous due to cell overheating and venting. Note that improvements to the NiMH technology are always being made and it is likely that new types may be appropriate for certain applications. A NiCd-only "smart charger" or "quick charger" may not be able to detect when a NiMH cell is fully charged. This could result in undercharging (the cell isn't charged completely) or (more likely) overcharging if the charger cannot detect a full-charge condition and frequently "cooking" the battery pack. Make sure your quick charger is specifically designed for charging NiMH cells before you use it. Charging a NiMH cell from the original NiCd "slow" charger should work, but it will probably take more than twice as long as it did with the NiCd charger. Typically, "slow" chargers will charge a NiCd pack in 12-16 hours, but this means that the same charger will probably take 30-36 hours to charge the NiMH pack. This extra charge time is required because the storage capacity of the NiMH cells are likely to have around twice the capacity of same-sized NiCd cells that they replace. Take note of the guidelines in the above section when you charge NiMH cells: They may not charge properly in a "smart" or "quick" charger and a slow charger will take much longer to charge NiMH cells. They have a much higher self-discharge current (see the chart above.) If you charge the battery pack and forget about it, do not expect it to still be charged months later. More recently, very inexpensive cells of various types have been appearing on the market made by companies that may be unfamiliar, or may be "re-branded" with the store's name on them. A number of people have written in saying that, in general, these "cheap" cells have proven to have about the same capacity as their more expensive name-brand counterparts. One interesting side-note, however, is that the reported "dud" rate (cells that were already dead or seemed to have suffered badly from self-discharge) seems slightly higher for these "cheap" cells than the name-brand cells. Even amongst those who have experienced this, they generally agree that even with the odd "dud" the "cheap" cells are still a better bargain than their more expensive counterparts - if you are able to identify the potential "duds" before you intend to use them. If you are planning to store cells in an emergency kit of some sort (but not stored in the equipment itself!) I would recommend that you use known-good brand named cells and relegate the "cheap" cells to everyday use where finding the occasional bad cell would be only an inconvenience! What could manufacturers do to prolong NiCd/NiMH cell life? It somewhat irks me that the appliance manufacturer's recommendation (i.e. to completely discharge a NiCd pack) is precisely the thing that can kill NiCd cells prematurely. What is so terrible about this is the cost of replacement and inconvenience that results: Often, the user will simply throw away the entire appliance. From an environmental perspective this means that devices are disposed of that otherwise have nothing wrong with them, and the Cadmium (a toxic heavy metal) often finds its way (illegally) into public landfills - and maybe into your drinking water. Don't recommend that the batteries be completely discharged. There is absolutely no need for this in most cases. Usually, one cannot completely discharge a pack without causing permanent damage to a cell by reversal, anyway. Build into the packs (or the appliance) a device that will cause current consumption to cease if any cell drops below, say, somewhere between 1.0 and 0.6 volts. This will prevent cell reversal from ever happening in the first place. An example of this sort of protection is found in all Lithium-Ion rechargeable battery packs that are made. In the case of Li-Ion cells, running them down below 2.0-2.5 volts is not recommended (as gas buildup, irreversible chemistry changes, and other cell damage can occur) and discharging them below 1.0 volts will not only cause permanent cell damage, but may constitute a safety hazard. Nowadays, Lithium-Ion (or LiIon) cells are ubiquitous - but you may have noted that you don't as often see rechargeable LiIon cells for sale in the way that you see "regular" AA and AAA cells. Why? One of the problems is voltage: Alkaline cells put out about 1.5 volts when fresh while NiCd and NiMH cells put out 1.2 volts under any load: Most devices are designed to accommodate individual cell voltage in this range. Rechargeable LiIon cells put out somewhere in the range of 3-4.2 volts per cell - depending on their state-of-charge. This fact along complicates attempts to use them as direct replacements for single Alkaline, NiCd or NiMH cells! If any one of the above conditions occurs, the cell/battery may fail catastrophically - as in explode, melt, catch fire, or (most likely) just ruin/damage it. It is for this reason that if you plan to use rechargeable LiIon cells in your own projects, you must take precautions in doing so. Fortunately, "protector circuits" designed for use with rechargeable LiIon cells and batteries are readily available - but one must still take care to prevent any of the above from happening. One thing about rechargeable LiIon cells is that their overall lifetime isn't as good as you might think. For example, at the moment they are constructed at the factory, their "lifetime clock" starts ticking - whether you use the cell or not - and this is due to the gradual chemical degradation of the cell's constituents over time! While there have been recent advances in cell chemistry to improve lifetime, it varies wildly with manufacturer (based on cost and quality of materials) and not to mention how the cell is being used. Remove them from the device if it is not in use. Many devices have removable battery packs - and often, these devices draw small amounts of current even when they are "off." Removing them reduces the possibility of self-discharge by the device, or by accident. If a LiIon pack is unused for a long period, check it once-in-a-while. The circuitry in many LiIon packs, in addition to protecting the pack from abuse, often has additional "battery gauge" circuitry, too. This circuitry puts a small drain on the pack that, in addition to the cells' natural self-discharge, will eventually deplete the pack even if it isn't connected to anything. This can be problematic, since one of the jobs of this circuit is to prevent "over-discharge." If the cell is too-deeply discharged (e.g. <1.0 volts) an irreversible chemical change can happen in the LiIon cell, causing recharging to be dangerous or impossible. If this circuit detects that this has happened, it may prevent the cell from ever being charged again! In other words, check the charge of the cell every few months. The easiest way to do this would be to charge it up and run it partway down before putting it away again. Supposedly, one can store "idle" LiIon cells in a refrigerator or freezer to extend their "shelf life" - but it is up to you to determine if that is applicable in your situation! If you do choose "cold storage" you should keep in mind that you must let the cell return to room temperature before attempting to charge it, or else damage might occur as the chemistry in typical LiIon cells does not "work" as efficiently at very low temperatures. Also, note that if you keep it in a freezer, it may accumulate moisture (frost) that, when thawed, could damage the electronics! Finally, don't forget that, even if frozen, that protection circuit may still be ticking away, slowly drawing down the battery, so don't forget to check it once-in-a-while! Finally, I would expect you to do your own research as well and not just take my word for it! While I strive to be correct, there's always the chance that I've made an error somewhere or misinformed, or that you, the reader, has somehow read something into what I have written that I didn't intend to say! Above all - be careful! Again, messing about with batteries/cells can be hazardous: Most cells contain hazardous materials and injury and/or damage can result from mishandling them. Do you have any comments or questions? Send an email. Please note that the information on this page is believed to be accurate, but there are no warranties, expressed or implied. The author cannot take responsibility for any damage or injury that might result from actions taken (or not taken) as a result of reading this page. Your mileage may vary. Do not taunt happy fun ball. The Floaty-Thingie web page - This device maintains the charge on NiMH cells that you may have laying around to keep them (gently) charged - a useful tool to counteract their tendency to run themselves down during non-use. Operating the FT-817 from Lithium-Ion (Li-Ion) cells- This page is a followup to the one on optimizing power consumption (above) and describes how Lithium-Ion batteries (which have a better energy/weight ratio than either NiCd or NiMH) may be used to power the FT-817. NOTICE: Because the manufacturers frequently change the links to this information, the links below are those that, at the time of writing, are for a Google search that yields the described information near the top of its results. Eveready (Energizer) Technical Data - There is useful data, specifications, and ratings of Alkaline, NiCd, NiMH, and other battery technologies. Link to Google search that yields this information. Rayovac OEM Product Guides - They some OEM product guides with some technical information on Alkaline as well as other types of cells. Link to Google search that yields this information. Duracell Technical Battery Data - This company has useful pages with data, specifications, and ratings on various battery technologies. Link to Google search that yields this information. Panasonic Lithium-Ion Rechargeable Batteries - A lot of data on various types of Panasonic Li-Ion products can be found, as well as technical data that can be applied to this and other Li-Ion products. Link to Google search that yields this information. Go to the main ka7oei.com web page. Any comments or questions? Send an email!